Charles Clevenger, M.D., Ph.D., and a team of researchers discovered that the enzyme cyclophilin A (CypA) regulates the Jak2/Stat5 genetic pathway. This pathway is responsible for the natural maturation of mammary glands as well as the development of breast cancer cells. By deleting the CypA enzyme in mouse models with ER-positive and ER-negative breast cancer, Clevenger and his team were able to inhibit the activation of the Stat5 pathway. This inhibition correlated to an increase in mammary tumor latency, which means they were able to slow or completely halt the growth of breast cancer cells. The discovery of CypA's contribution to the development of breast cancer was helped by previous observations of prolactin receptor (PRLr) signaling. Prolactin is the hormone that is primarily responsible for the production of milk during pregnancy, and earlier research by Clevenger has also linked it to the growth of breast tumors. By more closely analyzing the genetic pathways associated with PRLr signaling (including Jak2 and Stat5), CypA was revealed to be a major participant in the activation of those pathways. "This study demonstrated many similarities to other loss-of-function mouse models of the PRL-PRLr-Jak2-Stat5 signaling pathway. 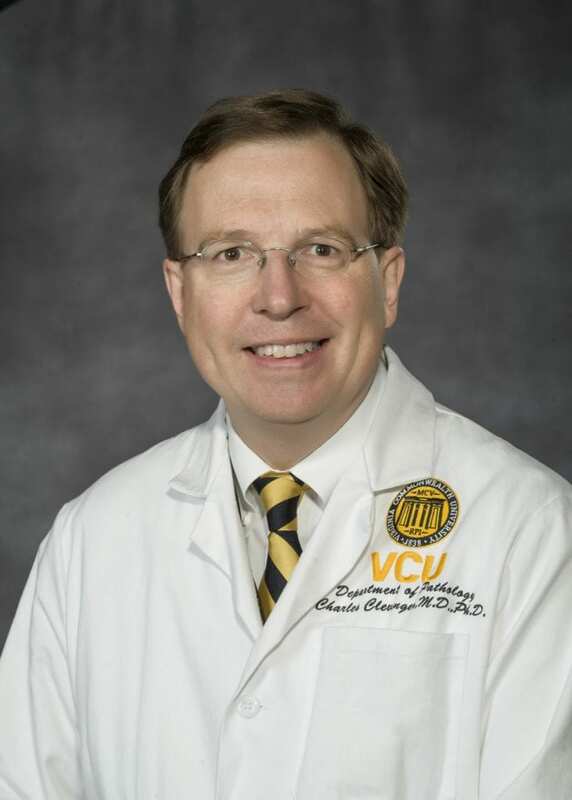 However, what distinguishes the CypA-deprived mouse models from the other genetic deletion models was the mice's ability to still successfully lactate and nurse their offspring, despite the loss of an enzyme critical to mammary gland development," said Clevenger, who is also the chair of pathology at the VCU School of Medicine. Clevenger believes the mice's continued ability to lactate is related to the fact that there is a significant, but not complete, deactivation of the Jak2/Stat5 signaling pathways. The research, published in Cancer Research, builds upon a decade of work performed in Clevenger's labs at Massey and Northwestern University. He said he and his team will continue to conduct further studies in pre-clinical models. Clevenger collaborated on this research with Sonja Volker and Shannon Hedrick of Massey and the VCU Department of Pathology, and Yvonne Feeney of Northwestern University.